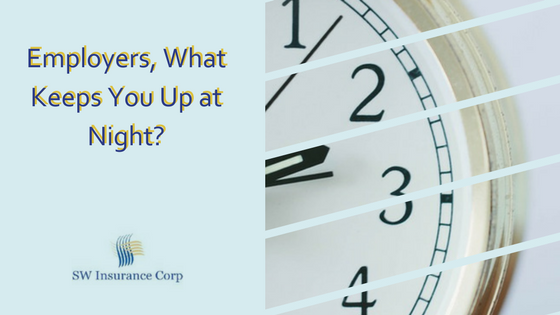 Employers, What Keeps You Up at Night? | SW Insurance Corp. Employers, What Keeps You Up at Night? It’s hard to wade through different insurance plans and premium packages. It’s enough to stress out even the most insurance savvy! As an employer, you have a responsibility to provide quality insurance options to your employees, but with changes in healthcare happening at a rapid rate, it can be overwhelming to make the right choice. What about the high cost of insurance for employees and the owners? There are different types of costs to consider here. You have co-pays, deductibles, out of pocket maximums and coinsurance requirements. Family plans and coverage options are also important. Currently, the ACA (Affordable Care Act) plans have Essential Benefits included that cover preventive care and do not have any pre-existing clauses. However, there are many non-ACA compliant plans available that do not offer these Essential Benefits, which simply confuses the consumer. These non-ACA compliant plans may or may not cover preventive visits and may not cover you if you have any pre-existing medical conditions. It’s a delicate balancing act between providing competitive benefits while managing costs and complying with regulations. Supplemental insurance options and pain-medicine alternative therapies are in high demand for most employees but may or may not be included. Most supplemental insurance options are “add-ons” to your medical coverage. What about the high-cost insurance to the company? This is where it gets complicated. Some may look at additional coverage options as a threat to the bottom line. On the other hand, having insurance that covers preventative medicine and pain management can go a long way toward company productivity and retention. The most recent example would be the opioid epidemic. If your employee is given the choice between $30 a month co-pay for pain medication or a $600 deductible for physical therapy sessions, which one will be the more likely option? When you consider that $18bn was spent last year alone by businesses in opioid-related medical issues and productivity loss, choosing a physical therapy and behavioral therapy option with low deductibles seems like the better choice. Should I offer additional disability, life insurance, supplemental, or dental coverage? These questions are important to consider. An all-in-one package may be the best way to go. Then again, you may need to tailor the package to fit your needs and budget. What regulations apply to me based on my business? Compliance with IRS regulations, knowledge of COBRA and State Continuation rules, and many administrative details like enrollment periods, renewals and claim solutions can be overwhelming. Like anything, however, fear of the unknown can cause more anxiety and worry than the actual problem. The more you learn about insurance coverage, the easier it will be to face it head-on. Don’t avoid the issue and select a package at random. It doesn’t do you or your employees any good. Remember that if you take care of your employees they will take care of your customers. Look for the best employee benefits your company can afford. You can always add on additional options or a better plan the following year. There are a variety of plans, trends, and options available. You don’t have to face it alone. You can use an insurance broker that specializes in Employee Benefits to help navigate the complicated insurance lingo and find a plan that gives you the best possible benefits for your employees while staying well within your budget. Using a broker is like outsourcing an HR department. They can be a liaison between you and your coverage needs without being on the payroll or take away from your bottom line. If you have questions, we can help. Call our 24/7 hotline at 720-344-1105 and we’ll get you started.